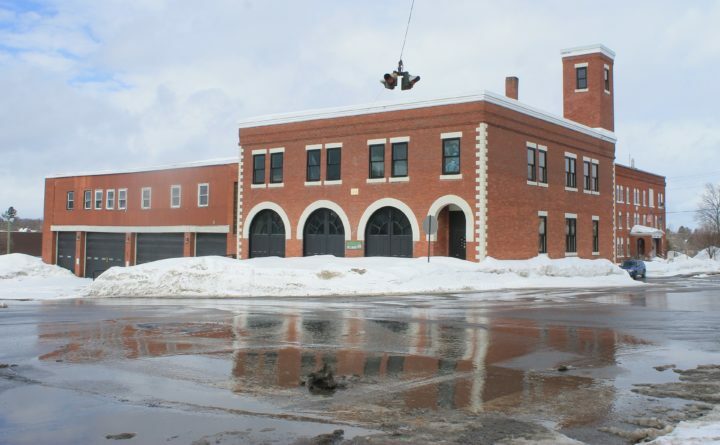 The former Presque Isle fire station, managed by the Presque Isle Historical Society, is seen with roads taking on snow melt at noon Monday. With temperatures beginning to reach above freezing, a thaw is underway for the second half of March. After a long and snowy winter, the middle of March is bringing a thaw to Aroostook County with one of the first significant warm ups since late January. With such signs of spring, however, also come fears that rain and melting snow might cause local rivers and streams to swell and flood. That is especially concerning with the 149.4 inches of snow recorded at Caribou since October, which is 66.9 inches above normal. “Wednesday will feature plenty of bright sunshine as a high pressure slides across the region,” according to the forecast. By Thursday and Friday, high temperatures could be topping off in the upper 40s, as warmer air is pulled north on southerly winds, according to the forecast. A mix of sun and clouds will give way to rain on Friday, with between a quarter to half inch expected across northern Maine. Despite the warm up and rain, the flooding risk will remain low in the short-term, according to the National Weather Service. “We are not expecting any ice breakup for the northern and central rivers basins, including the Aroostook, St. John, Piscataquis and Penobscot basins,” according to the forecast. This warm up looks to be short lived and cooler air with lower dew points is expected to arrive behind the system Friday night into the weekend. This will allow for the melting to slow. The longer-term outlook from the National Climate Prediction Center is that the second half of March will feature above average temperatures and above average precipitation. The weather pattern through the end of March also bodes favorably for maple syrup tenders in the region. Maine Maple Weekend is scheduled for March 23 and 24. In the long term, the flood potential for this spring“is well above normal for both ice jam and open water flooding,” the National Weather Service said. The highest threats are in the St. John and Aroostook river watersheds where large ice jams are locked in place. The Aroostook County Emergency Management Agency is keeping an eye on flooding risk and doing planning and preparations for this spring, said director Darren Woods. “This season is shaping up to be one of great concern for us,” Woods said. During 2008, Caribou received nearly 200 inches of snow. In late April 2008, the St. John and Fish rivers in Fort Kent reached record levels, causing extreme flooding, closing off roads, shutting down the international bridge between Maine and New Brunswick, and causing the evacuation of hundreds of people. Parts of southern Aroostook County, including Island Falls, also experienced flooding. A thaw in December created ice jams that are also of concern on the Aroostook and St. John rivers. “So we are really monitoring those especially closely,” Woods said. Nicholas Stasulis, data section chief with the U.S. Geological Survey, said that statewide, streamflow in the state is also above normal. “Groundwater levels, however, vary with some above normal, some much higher than normal and we even have some wells in Central Maine that are below normal,” he said. The U.S. Coast Guard has been monitoring ice conditions across the state, and shared their plan for ice breaking missions later in March on the Penobscot and Kennebec rivers to prevent ice jams which could cause flooding. The Maine Emergency Management Agency is working closely with the Aroostook County Emergency Management Agency to implement some proactive measures to prepare for flooding including flood preparedness meetings in several communities and a flood exercise scheduled for March 25. The Aroostook EMA, meanwhile, is urging homeowners in flood-prone areas to consider if flood insurance makes sense for them. Most flood insurance policies take effect after one month, so time is drawing near for policies that will be effective for this flood season, Woods said.